The Candle 79 cookbook is beautiful and is very easy to follow. 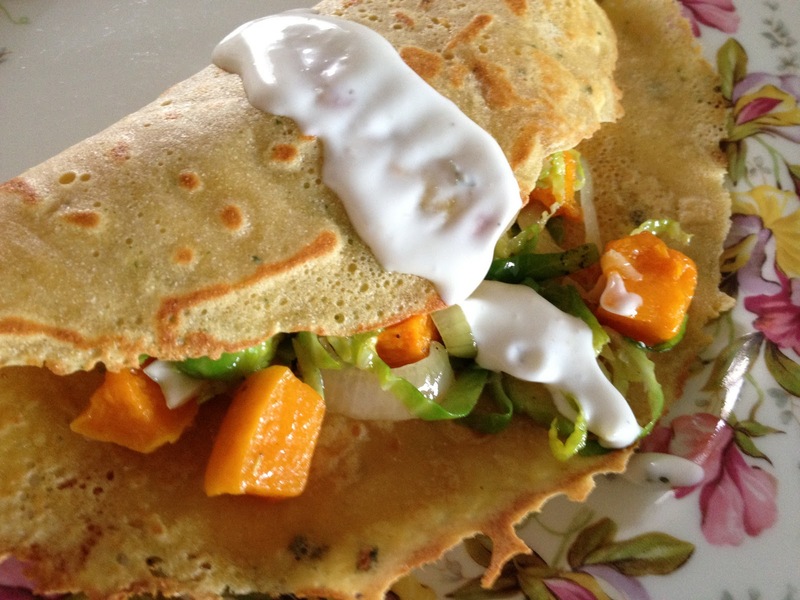 These chickpea crepes are amazing (and gluten-free) and have become part of our weekly menu. I stuff them with whatever I have on hand. Today for lunch I used leftover roasted butternut squash and paired it with nutty Brussels sprouts and sweet caramelized shallots. I made a quick aioli and voila, fancy but EASY lunch! ps do you see the little happy face on the crepe???!!! Find the recipe on page 130. Slice the shallots and saute in olive oil. Let them cook on medium flame and prepare the rest of the meal. Slice the bottom off of the Brussels sprouts and then shred them by slicing them thinly across. When the shallots are soft and translucent, add the Brussels sprouts. When they start looking bright green, add the squash so it can heat up. Season with salt and pepper. Make the aioli by mixing all of the ingredients together. Taste and adjust seasonings. Lay a crepe on a plate, fill with the filling, top with the aioli, and enjoy!